With much protest from the people of Malaysia and the action taken by the government, Lynas Corp. has agreed to send its waste to elsewhere if disposal site cannot be found in Malaysia. The article below is taken from The Star newspaper dated 7th March 2012. 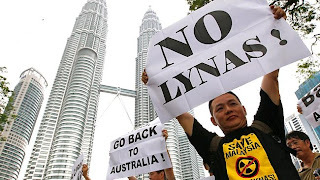 KUANTAN: Lynas Corp has submitted a letter of undertaking to send its rare earth processing residue elsewhere if no suitable waste disposal site could be found in Malaysia. “Failing that, Lynas has already expressed willingness to take the residue out of Malaysia,” said International Trade and Industry Minister Datuk Seri Mustapa Mohamed in a joint statement with Pahang Mentri Besar Datuk Seri Adnan Yaakob here yesterday. He said the Government would also set up an independent monitoring panel to audit the plant’s construction as an additional measure. A technical team that recently visited the project site would propose the working scope, terms of reference and expertise needed for the panel and the Government would appoint the panel members. On radiation monitoring, Mustapa said the plant had yet to start operations and the Government had not appointed independent experts to analyse the radiation level. He added that Western Australia Resources Minister Norman Moore had confirmed on Feb 29 that the radiation level from rare earth material was very low. Meanwhile, Lynas Corp chief executive officer Nicholas Curtis has invited Penang Chief Minister Lim Guan Eng to meet him over the rare earth plant. However, Lim said he intended to turn down the meeting, timed for his trip to Australia from March 23 to March 26, unless the anti-Lynas groups advise him otherwise. “Curtis should come and meet the people of Kuantan instead,” he said. “I’m surprised that they contacted me. I don’t know if (Curtis) got confused between Penang and Pahang, but he probably knows I oppose Lynas,” said Lim, adding that he was in no hurry to reply to Lynas’ e-mail. Lynas Corp was recently given a temporary licence to operate the Lynas Advanced Materials Plant in Gebeng, a half hour’s drive from Kuantan, to process rare earth mined in Australia.